It is 6:30 a.m. and I’d rather stay in bed. I struggle up. I’m a little stiff and can’t yet imagine any activity except tea and staring out the window for a while. I grant myself the pleasure of one steaming cup of a dark oolong. Now comes the crucial moment. It would be so easy to settle in. There’s the lure of the New York Times, a quick peek at email and Facebook, my journal, and well, just the time to curl up for a while with my own thoughts. And it’s chilly and overcast outside. But I get up and go out to my morning practice. I start the slow warmups, body still feeling creaky and lethargic. Hip circles, arms swings, weight shifts. Then the dance begins, at first tentatively, working my way into the long Tai Chi set that I’ve practiced for almost 40 years now. I know not to expect too much of this first 5-10 minutes. One doesn’t just automatically return to the ease and naturalness of the creek that flows around my house, or the great redwood trees that stand sentinel. Unlike we humans, they never depart from naturalness, while we live most of our lives in frozen awkward postures and contrived movement. We sit in front of computers; we spend endless hours behind the wheel of a car; we exercise in forced repetitive ways. To return to a natural, life enhancing way of moving has become, for us, a skill that must be cultivated and practiced. Now, about half way through my practice time, I notice with quiet satisfaction that my movement has become fluid again. Joints and muscles that I thought were getting rusty are now springy and resilient. The morning air which at first felt damp and dreary, now feels like a rejuvenating mist on my skin. I finish the set and go to work on a section or two that I want to refine, looping the movements together over and over to carve this energetic pathway into my nervous system and muscles. I finish up and stand quietly for a minute or two, appreciating the moment, appreciating the gift of being able to do this simple elegant thing every day. I don’t know for sure if it will add to my years and improve my health, things that regular Tai Chi practice is purported to do. I suspect this is true, and am indeed at least partially motivated by the hope of a more graceful journey into old age. But there’s more, something less tangible than a list of “benefits.” I think this more elusive thing has to do with honoring a pathway, something each of us is invited to do in life in a unique and personal way. When we find the pathway that clicks, the one that allows for an authentic expression of our natural self, the “self” that is most unaffected by artifice and ambition, then we must commit to it, like committing to a relationship for life. In Chinese philosophy and medicine we call this virtue. Cultivating it is a path to true happiness, which is the same as the path back to your natural self. Narrye Caldwell is a Licensed Acupuncturist, martial artist, and feng shui consultant. 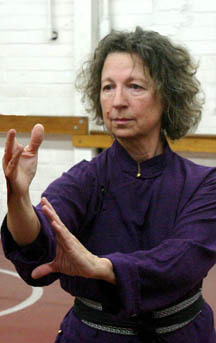 She teaches and practices Yang style Tai Chi Chuan, Qigong, and Bagua Zhang, and is on the faculty at Five Branches University. This entry was posted in Articles, Martial Arts and tagged kung fu, Martial Arts, tai chi. Bookmark the permalink.